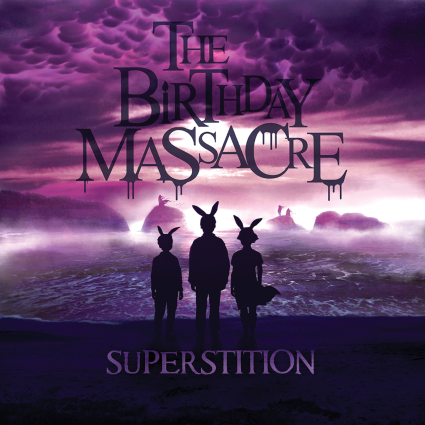 This ten-track release by Canadian Goth-rock sextet The Birthday Massacre represents their sixth studio album. It lives up to the hopes of those who have come to expect gorgeous, dark-themed female vocals by lead singer Chibi, delicious minor-key melodies and symphonic elements realized through heavy, down-tuned bass and guitar as well as synthetic accompaniment. From the opening track —“Divide” with Chibi’s ultra-sweet vocals and menacing, drone-like bass background — to the all-instrumental concluding track, “Trinity,” the theme is dreamy, hallucinatory and ethereal. Occasional hissing, menacing male spoken word interjections are set against her luscious singing. The flow is generally upbeat, with a few ventures into more complex, syncopated rhythms., The title track “Superstition” slows the tempo down to a pace that is just shy of depressing, giving the entire ensemble a chance to be heard and for soloists to sound off alongside a blend of synthetic effects. Fans and newcomers to The Birthday Massacre will enjoy poetic narratives, the seductive if somewhat vampiric propositions, the allegorical portrayals of such phenomena as the ocean, rain, the so-called coming of age and the mysterious “other side.” Above all, they will find themselves drawn into succulent melodies and mesmerizing rhythms that have been the signature sound of this band from their earliest appearance on the dark-music scene. 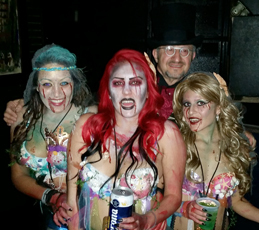 There are tons of Halloween related events here in the New York, New Jersey and Philadelphia area, but this year something possessed me into traveling with my crew south, to the Big Easy — to the capital of VooDoo in America — New Orleans, Louisiana. Staying at a hotel right on Canal Street provided easy access to the fabulous attractions of French Quarter, where everything that anybody ever yearns for is available in abundance…including Halloween celebrations. 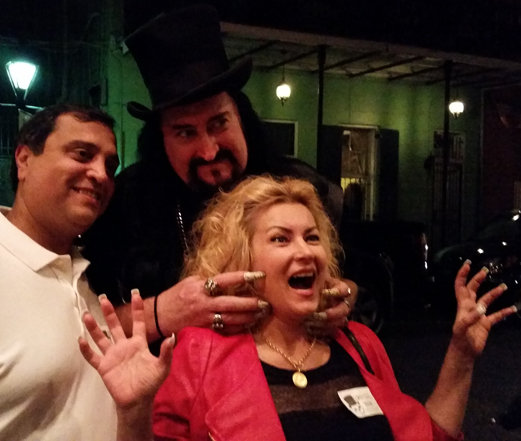 First up for us was the notorious Ghost and Vampire Tour hosted by Lord Chaz (www.lordchaz.com) that begins after dark and leads you around the scariest haunts on the periphery of the French Quarter. 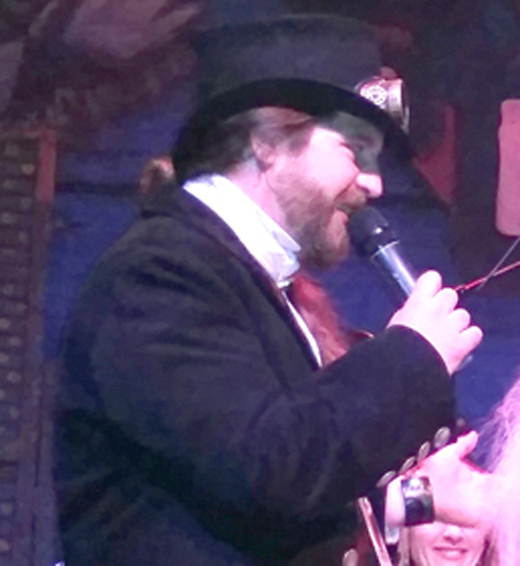 Astonishingly informative, highly educated and surprisingly courteous, Lord Chaz is a huge (in every sense), hideously eccentric NOLA icon, top-hatted and shod in 6″ platform shoes that deliver his 6′ barrel-shaped body to a towering and intimidating 6’6” height. His tour has been a NOLA fixture for more than 26 years, and commences at a dive bar, Johnny White’s “Hole in the Wall” on Bourbon St., where tour goers are encouraged to grab a tall drink to carry on the tour. 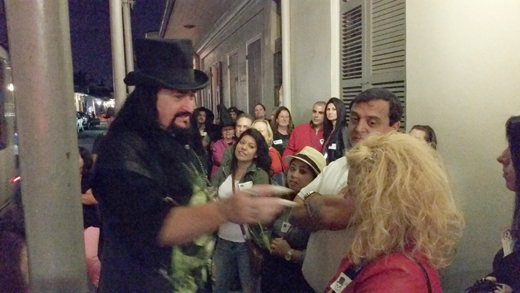 Anywhere up to 40 tourists are led on an hour-and-a-half trek through mostly dimly lit sections of the French Quarter while Chaz regales them with well-rehearsed stories of mass murders and hauntings from the history of the Quarter. Unsolved killings, second hand reports of apparitions and reference to a convent, where the remains of buried infants were found, comprise the meat of Lord Chaz’s dissertation. He spices things up with ambiguous, autobiographical, semi-confession of his own other-worldliness, gesturing with inch-and-a-half, pointed fingernails. He starts the event by a very convincing display of uncanny ability to stop his own heart, which numerous physicians & nurses in the group confirm by directly checking his pulse. It stops and dramatically restarts on his command! He makes much of his assertion that his cold, clammy skin and lack of need to blink are indications that he may actually be a vampire. And indeed, he feels as cold as a cadaver to touch, despite wearing robes and a hat in addition to his Goth attire over his 2 foot-long tresses. About halfway through the tour, Lord Chaz brings the group to another bar for more drinks and a restroom stop. You bet that these bars appreciate Chaz’s patronage. At the end of the tour he mounts an incredible display of piercing his own forearm with one of those menacing fingernails and drinking the unmistakable trickle of blood that flows from the wound. But not to worry! Before dismissing his spectators, he reveals an intact forearm, claiming that it had healed itself in the few minutes following the stunt. Hokey or real, Lord Chaz’s reportage, his claims and his performance are unanimously deemed powerful entertainment and super-fascinating by all who attend. 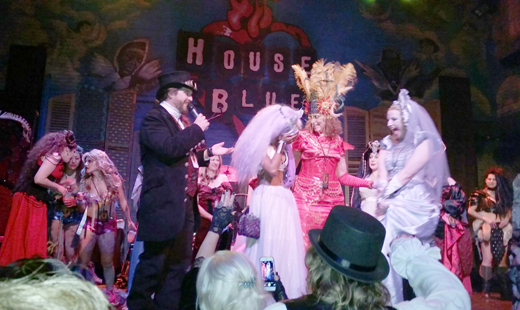 Halloween night started at the Lestat Coronation Ball, in a music venue called Republic New Orleans. It is apparently the main social and entertainment event in the middle of the Anne Rice Vampire Lestat Fan Club gathering at Undead Con, a convention held annually. We were somewhat out of place here, where the main population consists of devoted and die-hard Anne Rice readership. Once a crowd had filled the venue, the entertainment began. A female drum ensemble, Skins and Bones started the evening, charging up the crowd with a tribal, chanting, percussion-driven set. 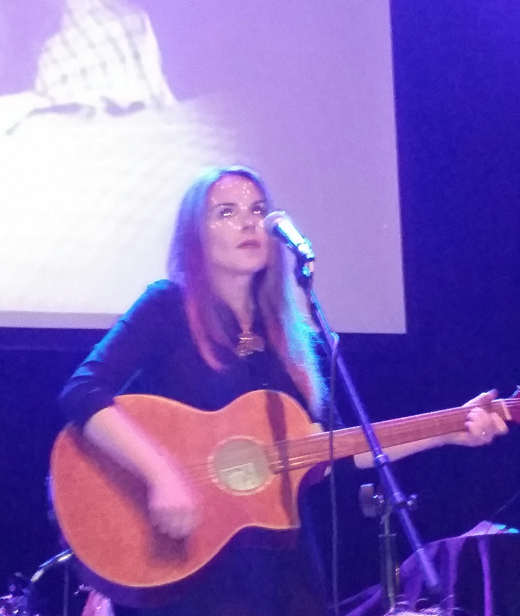 Then the supremely talented Mary Fahl, former lead vocalist of the sorely missed band October Project, came on stage. Her act only consisted of three songs, but she sang superbly under the less-than-ideal acoustic circumstances. One of the songs, “Exiles” is specifically written for the audiobook version of Anne Rice’s book, The Wolves of Midwinter, and was delivered in Fahl’s moving and inimitable vocal style. After her set, we visited with her at a booth alongside of the stage, grabbing a hug, a compilation CD and an autograph. 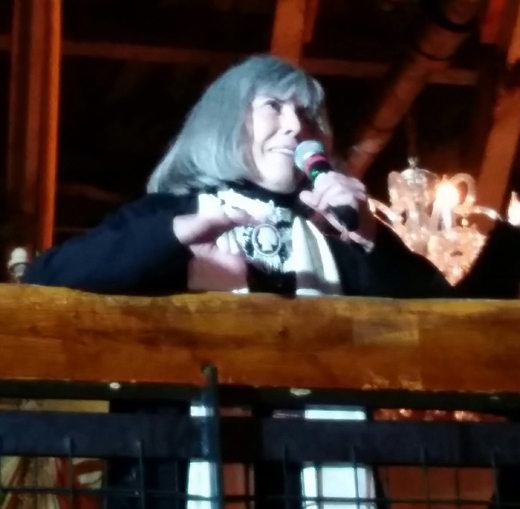 Anne Rice addressed the crowd from a loft overlooking the main floor, not unlike a pope — even a goddess to these fans —acknowledging the crowd and complimenting them on their grotesque, vampire-themed costumes. The mere sight of the author and the thrill of hearing her address literally brought tears to the eyes of many of her devotees. 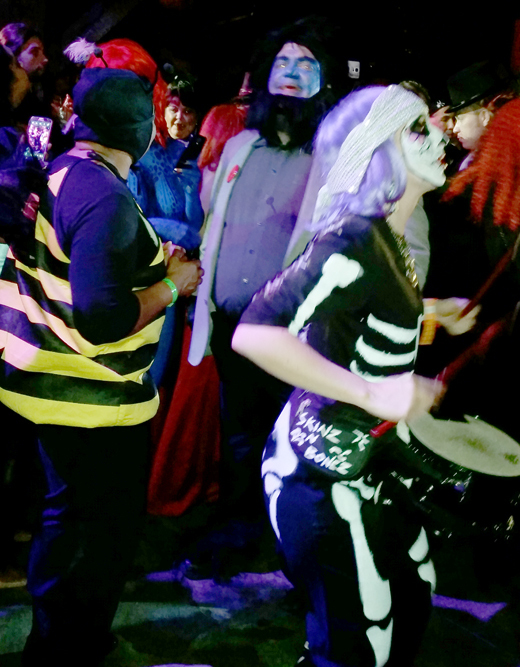 But the crowd was so dense and the dance floor so jammed, that we bailed out soon afterwards, choosing instead to wander the VooDoo shops and crowded streets of the French Quarter in order to observe the Halloween celebrants before calling it a night. 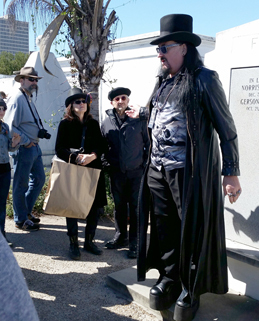 The following day we once again tapped the venerable Lord Chaz who took us on his famous tour of the St. Louis Cemetery No.1, New Orleans’ oldest graveyard yet still in current use. En route to the walking tour Chaz discussed various social, architectural and economic issues of the neighborhoods through which we passed. Once we arrived, he explained the necessity for above ground burial in this below-sea-level town. Instead of a grave, each deceased is interred in a brick and stone, reusable mausoleum. Grotesquely, each mausoleum becomes a sealed solar oven in the hot Louisiana/Gulf of Mexico sun, reducing the remains to an insignificant pile of dust that is subsequently swept onto the floor of the tomb a year later, making room for the next eligible family deceased. He pointed out that our visit on All Saints Day was the ideal time to tour, being the day when visitors come to honor their dead according to Roman Catholic tradition. 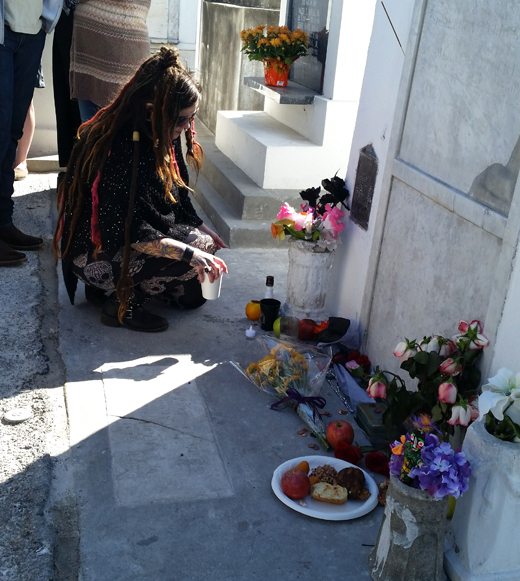 Indeed, upon entering the cemetery we were witness to a disciple kneeling devoutly at the tomb of VooDoo queen, Marie Laveau (1801? – 1881?) and carrying out a ritual with candles, icons, tobacco smoke and an alcoholic beverage. There was more to the tour, but nothing else could top that auspicious and serendipitous experience. 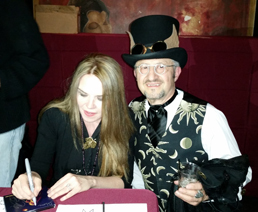 The Endless Night Vampire Ball, a recurring and world-wide event since 1998, and brainchild of producer and fang-maker Fr. 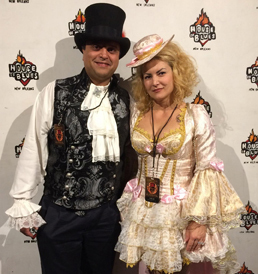 Sebastiaan — this year themed “Victoriental” — took place at New Orleans’ House of Blues on All Saints Day, the day after Halloween. It turned out to be one of the most over the top entertaining and social events ever to come out of this eccentric and eclectic subculture. 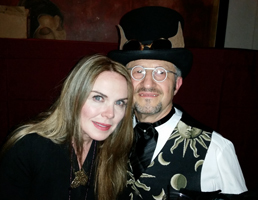 Goths, vampires, full time dwellers of the demimonde as well as poseur wannabes were treated to a true spectacular of music and performance art by impresario Fr. Sebastiaan and his talented crew of functionaries, artists, performers, DJs and technicians. 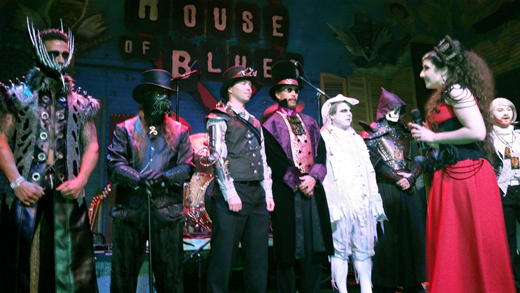 The NOLA House of Blues, one of a chain of eponymous venues, is uniquely themed for the event by virtue of its being in the Big Easy, America’s home to Voodoo, which religion provides a perfect backdrop for all things dark and preternatural. The crowd was gorgeously attired and costumed in Victorian, Edwardian, and glamorous as well as horrific presentation. Young and not-so-young mingled affably in am atmosphere of supreme camaraderie, seemingly overjoyed to participate in the festivities. Famous NYC DJs filled the air and filled the dance floor with heavy EBM, and Gothrock, both classic and modern re-mixes. 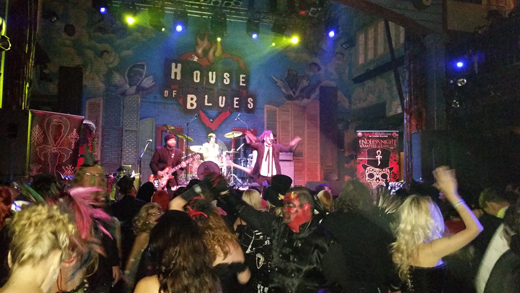 Wandering the House of Blues we found an upstairs lounge where a bar and a side stage were located and where performances and rituals were taking place. Back downstairs on the main floor, just when it seemed that the night would only consist of fabulous DJ-ing by the likes of DJ Angel, Matt V. Christ and Xris Smack, a French-accented, flamboyantly and Baroque-attired moderator came on stage and announced, in a hysterically dramatic manner, the first live entertainment of the night, the gifted and multi-talented soprano Ariel De Ment. Fanged and highly made up, known in the New York area for her mind-blowing renditions of cinematic and operatic singing, Ariel stunned the audience with coloratura versions of, first, an opera aria, then the heart-rending “Point of No Return” from Phantom. Following this thrilling act was a belly dancer accompanied by a kilt-clad violinist who led her with Middle Eastern and Celtic melodies. 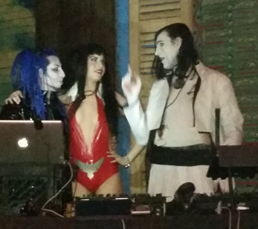 DJs filled the intervals between them, a burlesque dancer and then a staged, metaphysical vampire ritual involving sword play, bull-whip cracking, a priestess and several gorgeous, scantily-clad acolytes. The headline band, Metropolis Records artists Bella Morte, performed an hour-long, well-received set of their melodious-metal Gothrock with touches of Linkin Park-style funk. Eventually Fr. Sebastiaan came on stage to oversee selection of the most beautifully costumed female and male attendees, chosen by popular acclaim. He praised the crowd, and graciously thanked his staff, one by one, and by name. 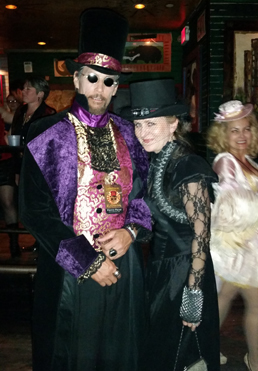 The theme for next year’s Endless Night, “Penny Dreadful,” was announced with much flourish and ritual. The Endless Night 2014 continued joyfully and with more celebrating on the dance floor well into the wee hours of the next morning, while thoughts of next year were already on the minds of many.